Both the frosting and the blondie are scrumptious. You’ll have a tough time deciding which you like best so why not have more of both? Grease a 13- by 9-inch (33 by 23 cm) baking pan. In a large bowl, using an electric mixer on medium speed, beat butter, brown sugar, eggs and vanilla until thick and smooth, about 3 minutes. Combine flour, baking powder and salt. Add to butter mixture on low speed, mixing until blended. Stir in apples and nuts, mixing well. Spread evenly in prepared pan. Bake until set and golden, 25 to 30 minutes. Let cool completely in pan on a wire rack. Brown Sugar Frosting: In a small saucepan over low heat, melt butter. Stir in brown sugar and milk. Bring mixture just to a boil then remove from heat and let cool to lukewarm. Stir in confectioners’ sugar, mixing until smooth. Spread evenly over bar. Let stand until frosting is firm enough to cut. Cut into bars or squares. Tip: This frosting is very soft when first mixed, which makes it very nice to spread. It firms up on cooling. Tip: Choose apples that are crisp, tart and not too moist. Granny Smith, Golden Delicious and Spartans are good choices for this recipe. 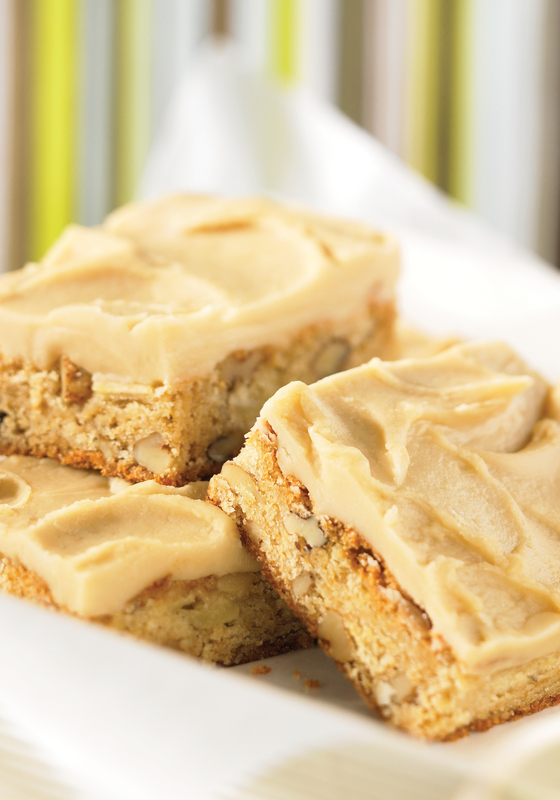 Variation: Omit the frosting if you prefer a plain apple walnut blondie. Variation: If you’re not a fan of nuts, omit the walnuts. Posted in Recipes, Desserts and tagged bars.